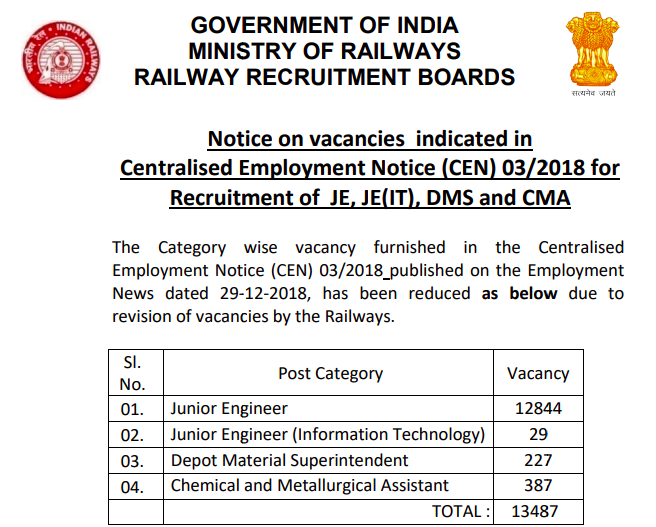 Railway Recruitment Board – RRB recruitment notification 2019 for Junior Engineer ( JE ), Depot Material Superintendent, Chemical and Metallurgical Assistant of total 13487 posts released. 5 How to Apply ? As per official notification, the Online Registration for the recruitment is already commenced, and candidates from all parts of the country applying for the exam. Candidates who doesn’t have fee exemption would need to pay Rs.500 for registration. Selection is based on the Merit list only. 1st Stage is for screening / filtering candidates, questions will be based on the degree standard. Those who get shortlisted in 1st stage will only be allowed to appear for 2nd stage. The number of candidates shortlisted for 2nd stage will be 15 times the number of vacancies. So nearly ~2 lakhs candidates will be shortlisted for the second stage RRB CBT exam. Architecture of Computers; input and Output devices; Storage devices, Networking, Operating System like Windows, Unix,Linux; MS Office; Various data representation; Internet and Email; Websites & Web Browsers; Computer Virus. b) Read all the Information and Instructions detailed in the CEN thoroughly before starting the filling up of application by clicking the CEN.03/2018 Link on the RRB Website. It is essential that the candidate understands all information of the CEN correctly to prevent any mistakes while filling application. before logging into the application page. d) Check RRB-Wise Vacancies for the qualification and Reservation Category of the candidate: The candidates are advised to check the post parameter table and vacancy table in this CEN to ascertain the vacancies notified against all RRBs for their qualification (Degree/Diploma) and ensure that the RRB to which they wish to fill in the online application is having vacancy for their discipline and community/category subject to eligibility in terms of age and medical standards. i) Post Parameter:-From the post parameter table candidate can ascertain the post(s) for which he/she is eligible as per qualification, categories like PwBD, and medical standards etc. ii) Vacancy Table:- To ascertain the comprehensive details of vacancy of all the posts notified against an RRB for his/her eligibility , candidate may select the RRB from the drop down list of RRBs from search menu and can view the vacancies of all the notified posts against various Railways/Units attached to that RRB on selecting the eligibility parameters. iii) After scrutinizing the vacancy table, candidates may decide the RRB for which they wish to apply duly ensuring that vacancy exists for their qualification and community/PwBD/ExSM category. Once the RRB has been selected, preliminary registration is completed and registration number is allotted, change of RRB will not be permitted under any circumstances. 1. Candidates should ensure that they possess/fulfill all eligibility conditions prescribed for post(s) as on the closing date of online registration (31.01.2019). CANDIDATES WAITING FOR FINAL RESULTS OF PRESCRIBED EDUCATIONAL QUALIFICATION SHOULD NOT APPLY. 2. Any candidate found using unfair means of any kind in the examination, sending someone else in his/her place to appear in the examination, attempt to impersonate will be debarred from appearing in all the examinations of all the RRBs/RRCs (Railway Recruitment Cell) for lifetime. He/she will also be debarred from getting any appointment the Railways, and if already appointed, will be dismissed from service. Such candidates are also liable for legal prosecution. and be very cautious about fake websites and job racketeers. 4. Scale of Pay: For Junior Engineer (JE), Junior Engineer (Information Technology) [JE(IT)], Depot Material Superintendant (DMS) and Chemical & Metallurgical Assistant (CMA):-Level 06 (RSRP 7th CPC Pay Matrix.) with initial pay of Rs. 35400/-, plus other allowances admissible at that time. Age: 18-33 years (as on 01-01-2019) (Please refer Para No. 5.0). 6. Candidates are required to go through the Post Parameter Table, Vacancy Table and ascertain their eligibility to apply through ONLINE mode any one RRB only, depending upon their eligibility. The selection of RRB once exercised shall be final. Application to more than one RRB, will lead to rejection of all the applications. information furnished by the candidate his/her application false/incorrect the candidate has suppressed any relevant information or the candidate does not satisfy the eligibility criteria for the post(s), his/her candidature will be rejected forthwith. After submission of application against this CEN RRBs shall not entertain any representation for modification of the information furnished in the application. 8. Candidates must ensure that they fulfill prescribed medical standards for the post(s) they are opting for. Candidates who are found medically unsuitable for the opted post(s) shall not begiven any alternative appointment. 9. Stages of Exam: There shall be two stage Computer Based Test (CBT). 10. Marks will be normalized as per the formulae given in Para No. 14.2 & 14.3 of this Notice. 11. RRB-wise shortlisting of candidates for 2nd Stage CBT shall be done at the rate of 15 times (may increase or decrease as per the requirement of Railway Administration). The shortlisting of 2nd Stage CBT will be based on the merit of the candidates in 1st Stage CBT. The RRB-wise shortlisted candidates for 2nd Stage CBT shall be advised through the official websites of RRBs and e-mail to download their e-call letter for appearing in the 2nd Stage CBT. 12. Negative Marking: There shall be negative marking for incorrect answers in CBTs. 1/3rd of the marks allotted for each question shall be deducted for each wrong answer. 13. Banned items:- Electronic gadgets like Mobile phones, Bluetooth, pen drive, laptops, calculators, wrist watches or any othercommunication devices or pen/pencil, wallets/purses, belts and metallic wears including ornaments etc., are strictly NOT allowed inside the examination hall. Any infringement of this instruction will entail summary rejection besides legal action including debarment from future examinations. 14.Candidates are advised in their own interest not to bring any of the above banned items to the venue of the examination, as arrangements for safe keeping cannot be assured. 15. Center/City allocation will depend upon technical and logistical feasibility. Candidates may have to travel to other Cities/States. 16. Candidates should have their own Mobile Number and valid & active e-mail ID as RRBs shall send all recruitment relatedcommunications only through SMS and e-mail. The Mobile Number and e-mail ID should be active till the completion of recruitment process. RRBs will not entertain any request for change of mobile number and e-mail address at any stage. 17. Before filling up of the online application, candidates are advised to thoroughly read the entire instructions and information in the detailed CEN available on the websites of RRBs.